During the 72-hour ceasefire in the Gaza Strip, which ended in the early morning of August 8, scores of Palestinian families returned to the rubble of their neighborhoods to salvage what they could of their belongings. Others buried the bodies of their loved ones, recovered from the tall piles of dust and concrete or from overflowing morgues. The Gaza Ministry of Health reports that there have been 35 separate incidents of attacks on various medical institutions and health facilities, including the bombing and targeted destruction of hospitals, clinics, nursing schools and ambulances – making the treatment of such diseases, as well as injuries sustained from Israeli airstrikes and shellings, an increasingly difficult task. Already, two prominent international human rights groups – Human Rights Watch and Amnesty International – have called for full investigations into possible war crimes committed by Israel during its month-long assault, especially on the health sector. Reports say that Israel deliberately targeted medical workers – including ambulance drivers, paramedics and doctors performing life-saving treatment – in direct violation of international laws. Amnesty International also called for a US arms embargo on Israel. “By continuing to supply fuel for military vehicles and fighter jets being used in attacks resulting in mounting civilian deaths and horrific injuries, the US government will have more blood on its hands,” said Brian Wood, Amnesty’s head of arms control and human rights, in a press statement. Under the seven-year siege imposed by Israel and supported by Egypt, Gaza’s capabilities for basic treatment of diseases, infections and injuries had already been damaged long before Israel’s bombs started falling, and physicians have been struggling to provide Gaza’s residents with the health care they need and deserve. WHO added that “funds were used for procurement of medicines, IV solutions, orthopedic surgical supplies and other medical disposables and coordination with health partners.” Most of the supplies, WHO said, have been delivered or are currently en route. Other independent human rights organizations, including the California-based Middle East Children’s Alliance, are collecting donations to purchase large quantities of basic supplies and medications for Gaza. Speaking to Truthout on August 8, Dabour said that because of recent medical supply shipments, there is just enough medicine now to keep the surgery and emergency departments running at al-Shifa – but other departments are in dire need of basic medicines. As of August 11, Israel’s attacks have killed more than 2,000 Palestinians, including 471 children, and have injured nearly 8,200, according to the Palestinian Centre for Human Rights. The United Nations estimates that nearly 400,000 Palestinian children will need advanced psychological support for chronic trauma, as children who are at least 6 years old have now witnessed three separate attack campaigns on Gaza during their lifetimes. Nightmarish stories have emerged of parents being forced to store the bodies of their small children, killed in Israeli airstrikes and tank shellings, inside ice cream freezers because the morgues were full. Other parents have come into Gaza hospitals in shock, holding plastic bags full of their children’s body parts. Health workers have described treating lone child survivors of massacres that killed entire families. On August 7, El-Farra told Truthout that her staff have noticed a dramatic increase in the numbers of patients coming in with skin and upper respiratory tract infections – signs of serious communicable diseases. On July 25, Ayed al-Buraey, a 28-year-old paramedic, was killed “when Israeli forces shelled the ambulance he was in while he and his crew were on their way to evacuate the injured in Beit Hanoun. The shells struck the ambulance and set it on fire,” reported Mohammed Suliman in Al-Akhbar. According to the Ministry of Health in Gaza, al-Buraey was one of 19 doctors, nurses, paramedics, ambulance drivers, fire truck drivers and firefighters killed in Israeli attacks. Eighty-three medical workers have been injured. 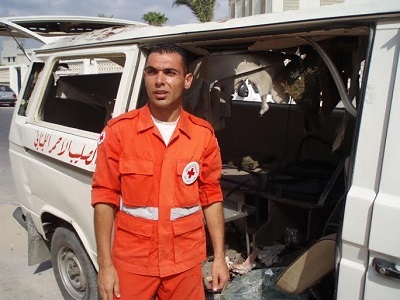 Lebanese Red Crescent workers and their ambulances attacked by the IDF, July 2006. (Photo: Dahr Jamail)Amnesty International released a statement on August 7 indicating that there is “alarming evidence” that Israel has committed war crimes in targeting health facilities and medical workers during the month-long assault on Gaza. “At least five hospitals and 34 clinics have been forced to shut down due to damage from Israeli fire or continuing hostilities in the immediate area,” the organization stated. “Such attacks are absolutely prohibited by international law and would amount to war crimes. They only add to the already compelling argument that the situation should be referred to the International Criminal Court,” Amnesty International states. Lebanese Red Crescent workers and their ambulances attacked by the IDF, July 2006. (Photo: Dahr Jamail)Along with Amnesty International’s report of the mounting evidence of war crimes committed by Israel – especially in regard to the targeting of medical workers and facilities – Human Rights Watch also released a report on August 4 which accuses Israel of war crimes. Among documented evidence that Israel had summarily executed civilians fleeing their homes and carrying white flags, evidence has emerged of Israel deliberately targeting Palestinian paramedics and rescue workers in the eastern Gaza village of Khuzaa. In the first week of the attacks, Israeli rockets struck the al-Wafa Rehabilitation and Geriatric Hospital which cares for patients who are paralyzed, severely disabled or who have serious mental disabilities. By the second week of the war, the army had forced al-Wafa’s physicians and staff to evacuate all the patients to other facilities or family homes. On July 23, Israeli warplanes and tanks had leveled the entire building, turning it into rubble. According to the hospital’s director, Basman Alashi, the hospital held $7 million worth of life-saving equipment and specialized machines to rehabilitate physically disabled patients. Alashi said in an interview with me in The Electronic Intifada that Israel claimed the hospital was being used by Palestinian resistance factions, though no evidence was produced. He added that Israel was “determined to bomb the hospital, whether there [were] any activities around it” or not. “These are people who are meant to disrupt the whole system in Gaza; they are meant to deprive the people from having medical rehabilitation,” Alashi said. He noted that as many as 30 percent of Gaza’s newly injured will need medical rehabilitation – and the only hospital that specialized in such services has now been bombed to rubble. “So the action of the Israelis has created a new generation of handicapped in Gaza,” he explained. During the past month, in addition to bombing al-Wafa hospital to dust, Israel struck and damaged al-Shifa hospital in Gaza City – Gaza’s largest hospital complex – as well as al-Awda hospital in Jabaliya, al-Najjar hospital in Rafah, Balsam and the Beit Hanoun hospitals in Beit Hanoun, the Algerian hospital in Khan Younis, the al-Aqsa hospital in central Gaza, and the Kamal Odwan hospital in northern Gaza. In the northern Gaza town of Beit Hanoun, El-Farra explained, the main hospital was surrounded by the army and the staff was not allowed to evacuate. “This is not a new practice by the Israeli army. This happens all the time in frank violation of the Fourth Geneva Convention which [guarantees] protection of health workers in times of peace and war,” El-Farra said. During Operation Cast Lead, Israel’s three-week assault on Gaza in December 2008 to January 2009, Al Mezan Center reported that the Israeli army killed 23 emergency workers, including medics, firefighters and sea rescue workers, 17 of who were on duty at the time they were killed. A further 50 emergency workers were injured. Twenty-two ambulances were damaged or destroyed. Again, Gaza hospitals and clinics were targeted and damaged in shelling and airstrikes. In Israel’s eight days of continuous attacks on Gaza in November 2012, at least six medical institutions were damaged in Israeli attacks, according to the Palestinian Centre for Human Rights. And eight years ago, in 2006, Israel deliberately targeted ambulances and paramedics during its month-long attacks on Lebanon, which killed 1,200 people. Truthout’s Dahr Jamail reported from Lebanon during Israel’s 2006 attacks. He said that Israel’s tactics in Lebanon were “far worse” than tactics used by the US military in Iraq. “I saw firsthand, several times, Israeli army attacks on Red Crescent ambulances, Red Crescent medical workers, and rocket or missile attacks on Lebanese health infrastructure like medical clinics,” Jamail told Truthout. Jamail said he also reported on how the Israeli army would “drop leaflets on towns and villages in southern Lebanon, instructing people to leave, then would rocket and bomb civilians as they fled in their cars while holding white surrender flags outside their windows.” Such scenes were repeated, as previously mentioned, just two weeks ago in the town of Khuzaa in Gaza. “All of these represent gross violations of the Geneva Conventions, and are, of course, war crimes. As horrific as the tactics the US military used in Iraq were, what I saw the Israelis do in Lebanon was far worse,” Jamail added. In early 2012, the European Commission released a report saying that nearly $66 million in projects it had funded were destroyed or damaged by the Israeli army between 2001 and 2011. Covering 82 separate attacks on Palestinian infrastructure in the occupied West Bank and Gaza Strip, the Commission report documented Israel’s destruction of a fleet of Palestine Red Crescent ambulances. Along with Amnesty International’s call for a comprehensive embargo on the United States’ shipments of weapons to Israel, human rights activists around the world are backing the Palestinian-led boycott, divestment and sanctions (BDS) movement to hold Israel accountable for its violations of international law. Across the globe, Palestine solidarity activists held an international “Day of Rage” on August 9, to condemn Israel’s actions and build the global BDS movement. Many of Gaza’s doctors, nurses and paramedics have not been paid salaries for months due to the fragility of Gaza’s economy under Israeli siege, yet during the past month of Israeli attacks, these physicians have put their lives at risk in the service of others. Nora Barrows-Friedman is a journalist and staff editor with The Electronic Intifada. Her book, In Our Power: US Students Organize for Justice in Palestine, will be out in November 2014 from Just World Books. Follow her on Twitter @norabf. A teenage blogger and the father of a toddler describe what it’s like to be civilians under attack in Gaza.